House Across From Westboro Baptist Is Painted With Gay Pride Rainbow Colors : The Two-Way Aaron Jackson bought the house specifically to counter what he said is the church's message of hate. "Instead of millions of children around the world getting this hate message, they're going to see this message of compassion and love," Jackson said. 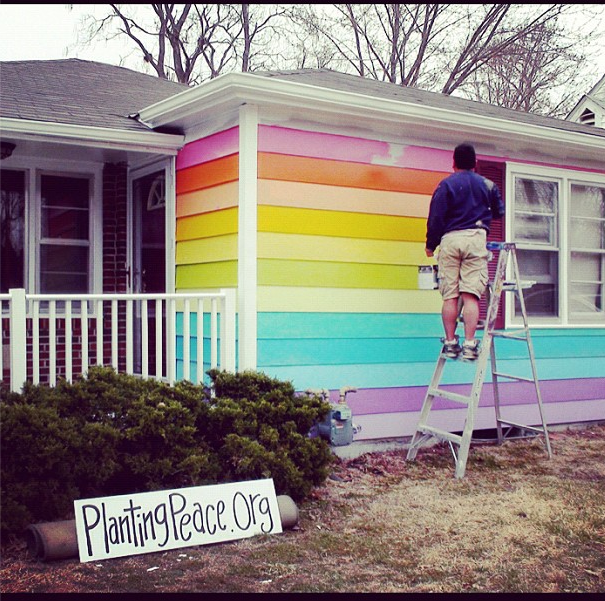 Planting Peace is painting the house across from the Westboro Baptist Church in Topeka with the colors of the gay pride rainbow. Aaron Jackson took inspiration from a 9-year-old kid who stood up to Westboro Baptist Church protesters. As Mark wrote last year, Josef Miles stood in front of protesters carrying signs that read "God Hates [Gays]" with his own sign that read "God Hates No One." Today, Jackson is following through on a project that started about six months ago when he decided to buy a house across the street from the infamous church in Topeka, Kan.
Jackson and volunteers began painting the house in the colors of the gay pride rainbow. Once they are done, they will also add a huge rainbow flag in front of the house. "It looks like something that should be at the U.N., not in a residential neighborhood," Jackson told The Destin Log. Jackson, whose charity Planting Peace, has opened orphanages and bought endangered forest land in Peru, told Gawker earlier today that they have renamed the building "Equality House" and the project seeks to fight bigotry. As we've explained before, Westboro Baptist has attracted publicity in recent years for protesting against homosexuality, abortion and other issues outside the funerals of military veterans and celebrities. "... to ride the coattails of Westboro's own media strategy. 'We're going to take the negative attention and try to spin it into something positive,' Hammet said. 'Instead of millions of children around the world getting this hate message, they're going to see this message of compassion and love.'" The Kansas City Fox affiliate reports that Jackson said throughout the day, people have driven past the house "honking horns, taking pictures." "There has been no negative response," Jackson said. This video posted on Twitter gives out an idea of the proximity of the house to the Westboro Baptist building.